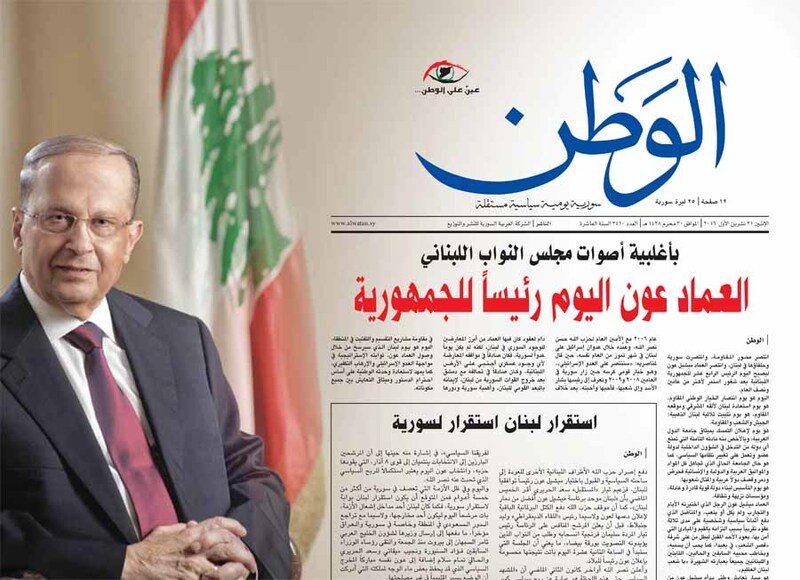 The election of Syria’s enemy-turned-ally General Michel Aoun as president of Lebanon on October 31 was given rare front-page coverage in the Syrian press. Radio stations in Damascus broadcast the parliamentary session live on air, hailing Aoun as a welcomed newcomer to the “Axis of Resistance” that includes Syrian President Bashar Al Assad, Russian President Vladimir Putin, Hezbollah chief Hasan Nasrallah, and Iranian President Hasan Rouhani. On Syrian streets, however, news of Aoun’s election was received with mixed feelings. Years back Syrians had been taught and indoctrinated to hate him at schools and in political rallies, and barely any mention was made of the Lebanese General in the Syrian press or on Syrian TV. When they did mention him he was always referred to as an outlaw and an agent of the United States. In the polarized world of Syrian politics today, the pro-government camp sees him as a friend, whereas opponents trash him as an arch enemy for his public ridicule of the Syrian opposition at numerous occasions since 2011. 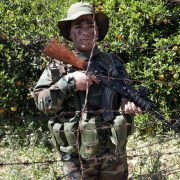 During the final stages of the Lebanese civil war, General Aoun had declared a “War of Liberation” against the Syrian Army, with its 40,000 troops stationed in Lebanon at the time. In March 1989 Aoun was serving as Army Commander and interim Prime Minister — a de facto head of state in the absence of a constitutional president. Aoun allied himself with Iraqi leader Saddam Hussain — a sworn enemy of then-President Hafez Al Assad — and reportedly received arms from Iraq to fight the Syrians out of Beirut. When Damascus and Riyadh called for an endgame conference to the Lebanon war in Taif, Saudi Arabia, in October 1989, Aoun refused to attend and dismissed all Lebanese participants as traitors. Ironically, upon his election this week, Aoun pledged to uphold and protect the Taif Accords, whose product is the current election law and political system that heralded his rise to the Lebanese presidency. Saddam’s summer invasion of Kuwait in 1990 destroyed Michel Aoun’s ambitions of rule — Al Assad allied himself with the Americans and Saudis, who in turn, approved the Syrian Army’s attack on Baabda Palace for the final ejection of Aoun from the seat of power. He was forcefully removed by the Syrians in October 1990, three months before the Syrian Army went to the Arabian Desert to take part in Operation Desert Storm. Aoun was given political asylum in Paris and spent the years 1990-2005 leading the opposition-in-exile to Syrian hegemony in Lebanon. 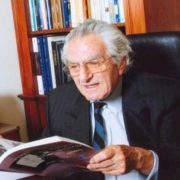 His party was outlawed in Beirut, his followers harassed or exiled, and for years he was personally banned from appearing on Lebanese television by General Ghazi Kenaaan, the commander of Syrian troops in Lebanon. In 2004, Aoun boasted that he was behind the Syria Accountability Act in the US Congress, which led to UN Security Council Resolution 1559 that called on the Syrians to withdraw from Lebanon. That resolution, topped with the murder of Lebanese Prime Minister Rafiq Hariri led to Syria’s forced exit from Lebanon in April 2005 and the return of General Aoun just 11-days later. 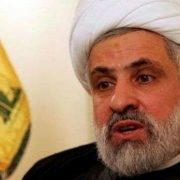 He squarely positioned himself as a member of the anti-Syrian March 14 Coalition, led by Hariri’s son Saad, cheering the Syrian defeat, but parted ways with the anti-Syrian camp in early 2006, tactically allying himself with Hezbollah leader Hassan Nasrallah. Aoun wanted to become president of Lebanon at any cost. 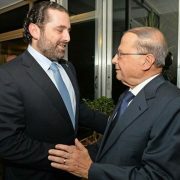 He realised that given the heavy Christian presence in the 14 March Alliance, Saad Hariri had other obligations toward presidential hopefuls like ex-President Amin Gemayel and Samir Gagea, a former political prisoner and sworn Aoun enemy who was released from jail just after Syria’s exit. Hariri wanted a ceremonial Christian head of state to empower the Sunni premiership, and Aoun wanted full authority vested in the Maronite presidency — just like it had been before the Taif Accords. Realizing that Hezbollah was getting the upper hand in Lebanese politics due to its numbers, power base, foreign backing, and arms, Aoun re-positioned himself as a staunch ally of Nasrallah, who promised to make him president of the republic one day. In turn, Aoun pledged to support and protect Hezbollah’s arms and lived up to his promise during the 2006 Israeli-Lebanese War. Despite loud objections from mainstream Lebanese politicians about Hezbollah’s triggering of that deadly conflict, Aoun refused to budge in his support for Nasrallah. He also refused to criticise Nasrallah’s 2012 decision to send troops to Syria, arguing that it was vital to defeat Daesh. In turn, Nasrallah crossed off every single presidential hopeful over the past two years, including ally Sulaiman Frangieh, saying the position will be occupied by Aoun or nobody else. 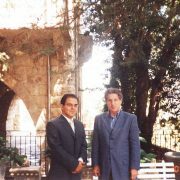 During the years 2006-2011, Aoun also became a frequent visitor of the Presidential Palace in Damascus, becoming a personal friend of Bashar Al Assad and receiving front-page coverage in the Syrian press, even appearing on talk-shows in official and semi-official television channels. Hours after his election on Monday, Aoun received a congratulatory telephone call from Al Assad, his first from any Arab leader. Aoun also visited Tehran in 2008, prompting President Hassan Rouhani to express satisfaction with his election on Monday, saying that it is a victory for Hezbollah. 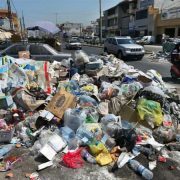 Surprisingly, Aoun’s Christian constituency followed him blindly during his roller-coaster career. When he commanded them to fight the Syrians back in the 1980s, they did so with zeal, and when he said that he was turning a new page with Damascus in 2008, they followed along obediently. He explained his U-turn saying that his war with Syria was “an old story now” and in return, Al Assad remarked that Aoun was an “honorable man in adversity and then honorable in reconciliation.” Aoun remains indebted to Syria’s ally Hezbollah for his victory — in what seems to be a behind-the-scenes agreement between Saudi Arabia and Iran or Syria. In exchange for making Aoun president, the 83-year old general will appoint Saad Hariri as premier — a position from which he was ousted by Hezbollah back in 2011. This duo will undoubtedly lead to trouble, as the two men have never gotten along and they represent two opposites on the Lebanese political spectrum. Hariri remains fervently opposed to the regime in Damascus and actively involved in supporting its opponents and in welcoming Syrian refugees, whereas Aoun wants good relations with Damascus and when addressing Parliament on Monday, hinted that the refugees need to go home — although most would not dare given that they are namely from towns and villages currently in flames, which had risen in protest back in 2011. Hariri remains a Saudi favorite while Aoun is critical of the Saudis and remains very close to Iran’s allies.